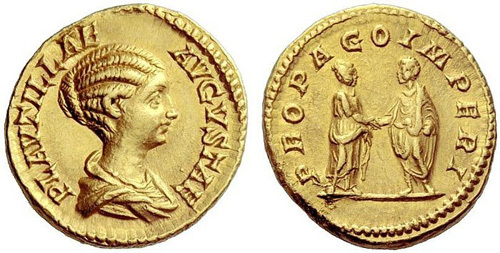 Plautilla, the daughter of the powerful praetorian prefect Plautianus, was married to Caracalla in A.D. 202. On the fall of her father in 205, she was banished to the Lipari Islands where she was murdered by the orders of Caracalla in 212. Obverse: PLAVTILLAE AVGVSTAE, Draped bust right, hair coiled in ridges, either vertical or horizontal and fastened in bun at back. 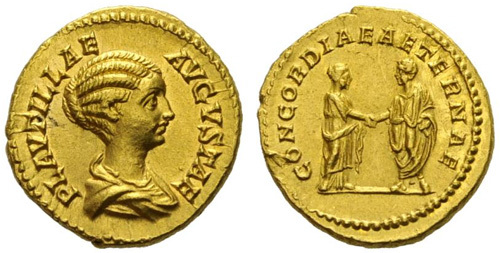 Reverse: CONCORDIAE AETERNAE, Caracalla standing left, clasping right hands with Plautilla, standing, right. 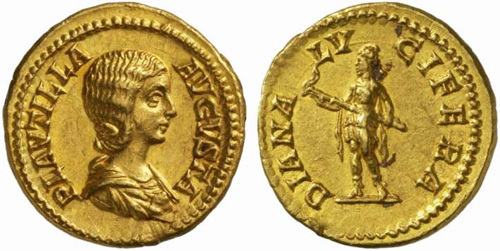 Reverse: PROPAGO IMPERI, Plautilla and Caracalla clasping hands. Obverse: PLAVTILLA AVGVSTA, Draped bust right, hair firmly waved and drawn down on neck. 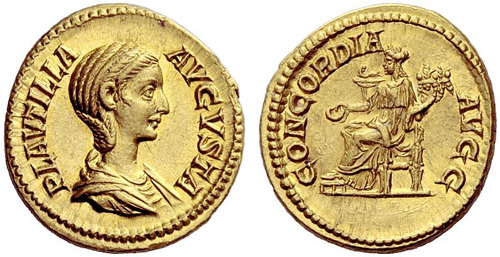 Reverse: CONCORDIA AVGG, Concordia seated left, holding patera and double cornucopiae. Reverse: DIANA LVCIFERA, Diana standing left, holding torch in both hands. 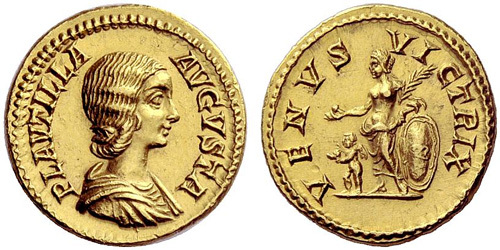 Reverse: PIETAS AVGG, Pietas standing right, holding scepter and child.